Edward Joseph LeBlanc, Jr. was born on a farm 4 miles south of Erath on May 31, 1920. Early in his childhood, his family moved to Abbeville and he entered public schools. While at Abbeville High School, he delivered the Times Picayune and played on the baseball team finishing with a league high batting average of over .500. He graduated from Abbeville High School in 1937 as Salutatorian. He attended LSU where he completed his pre-med courses with honors and was accepted into the LSU Medical School at New Orleans. While at LSU, he participated in the ROTC program and in 1942 received his commission as a 2nd Lieutenant. He received his Medical Degree and Internship at LSU and, in 1944, was called to Active Duty as a medical officer. He served in the United States and Japan, where he was Regimental Surgeon of the 12th Calvary Regiment of the 1st Calvary Division. At the time of his discharge in 1946, he had risen to the rank of Captain. For his service with the Calvary, he received the Bronze Star Medal and various other Service Medals. Following his release from Active Duty, he did his residency at Lafayette Charity Hospital under the supervision of Louisiana State Medical School. Upon completion of that residency, he opened a family practice in Erath, LA. 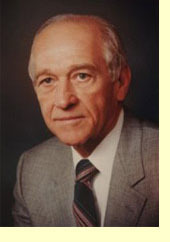 In 1954 he returned to LSU School of Medicine and completed residency in Surgery. In 1958, he opened his practice in Lafayette with Donald Williams as Williams and LeBlanc. Concurrently with his practice of medicine, he became breeder of the oldest existing breed of domestic cattle, the Brahman bull. With deliberate and technical skills, he developed an outstanding breed of Brahman recognized worldwide. He bred and developed the Great EJL Emperex Bull which won 28 Championships in 10 major ABBA shows; the 1982 National Champion; the 1983 International Champion 203 Bull; and the 1983 Reserve International Champion 305 cow. He furthered his reputation by breeding the Famous 309 Bull, who is now #4 in the Registers of Renown Breeds, who's offspring dominated the Show Winners at the World Congress held in Houston in 1984. He was honored as the Premier Breeder of the ABBA in 1981 and was honored as Cattleman of the Year at the Louisiana Cattle Festival. He was nationally recognized for his achievements in breeding and was invited by Texas A& M College to serve on a panel of experts for Frame Size in the Brahman breed. Dr. LeBlanc was deeply involved with young people who had an interest in cattle. He gladly presented lectures and instructions to them. He went further by helping them select young animals for raising and exhibiting, allocating a large portion of his breed for this purpose. He was known worldwide for his knowledge as an animal breeder and was asked to lecture in Guatemala. Upon retirement from the cattle business and Medical practice, he became deeply involved as an avid breeder of camellias and roses. There again, he received much recognition as his roses and camellias were winning awards throughout Louisiana. He was devoted to the needs of special children, donating to the Alleman Center at Acadian Village, a green house for plants. He truly lived his life like he said, "In the pursuit of excellence, one never crosses the finish line." Dr. LeBlanc married Gertrude Decharme of Lafayette and had six children: Claude Roy LeBlanc married to Lena Marie Sparacio; Claudette Marie married to Dr. Robert Parker St. Amant; Edward Joseph married to Laura Girouard; James Donald married to Evelyn Ann Gauthier; Edith Ann married to George Michael Parsons, and Michelle Louise married to Tracy Peter Curtis. He has sixteen grandchildren.